Happy New Year everyone! I have been reflecting this evening on some obtainable goals for this year, and I came up with the following list. How about you? What are your goals for 2012? Well, whether it’s your goal or not I know you will inspire us! Go ahead and link up your projects for the week! P.S. If you haven’t entered the giveaway to win the Haven Conference ticket. You still have time!!! Be sure to enter! I am about as late as a person can be–yours is a Tuesday party, and today is THURSDAY, not Tuesday. But I wanted to link up my little wreath project, so I was glad to see that your linky is still open! I like your new year’s goals. I stink at goal-setting (never mind keeping! ), but it inspires me to see other people’s resolutions. May 2012 be blessed for you and your beautiful family! Thanks for hosting Beth!!! 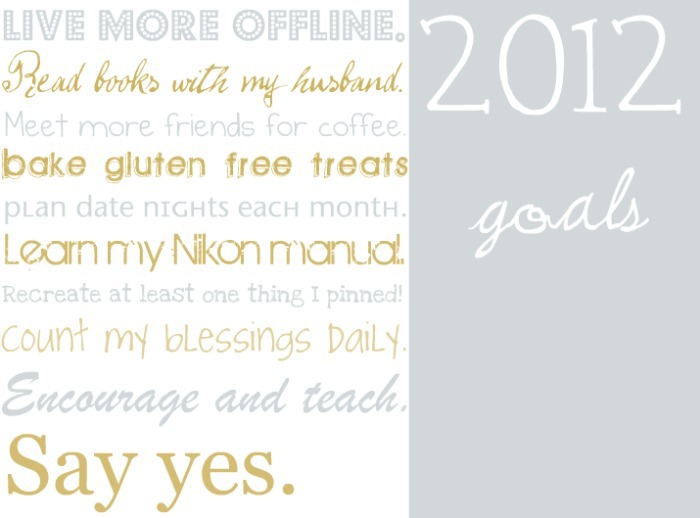 All great goals for 2012! I too hope to work on doing my pins and meeting friends more often! Except for the Gluten free treats (and the fact that I have a Canon, not a Nikon) I think I will just co-opt your goals into some of the ones I have already. A big one of those is to get back into shape. 🙂 Thanks for hosting the party and Happy new Year! Happy 2012! Love your list! Thanks for hosting, Beth! And Happy 2012! Great list of goals. Thanks for hosting. Happy New Year. Thanks for hosting, Beth! I LOVE your printable goals–so pretty and good goals too. 🙂 I shared my recipe for a Homemade Panini today-yum! Thanks for sharing 🙂 I agree, live more “offline” is a good goal for me to! I love your goals! I am determined to figure out my Nikon as well. I mean I got it because of how amazing it is and I’m still just using Auto all the time. Thanks for hosting! Happy New Year too! Goal lists are great and it feels so rewarding when you can cross them off. As a fellow blogger I think your first one is going to be the hardest 🙂 Best of Luck with attaining each and every one of them and more this year. How ironic that one of your goals is Live More Offline (the 1st one, as a matter of fact!) I only did blog goals. Huh. But then, I’m a ‘yes’ gal too who needs to learn to say ‘no’. Or at least, ‘let me think about it’. Thanks for hosting! It is definitely my number one goal this year! Blogging can very easily become all-consuming and last year I most definitely neglected my offline life. I want to be more intentional on maintaining relationships/friendships that have nothing to do with blogging which is VERY difficult for me. Thanks for sharing your list of goals! I have a tendency to overcommit, especially when it comes to volunteering, so “say no” is at the top of my list this year 🙂 Happy New Year! I say no to everything :). No is on the tip of my tongue all too often and I need to learn to say yes to the important things in life and no to the distractions.